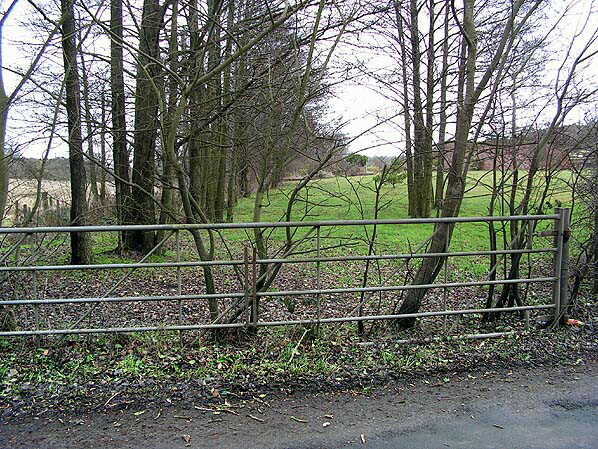 Notes: Pentresaeson Halt was situated on the Wrexham & Minera Railway which in its original form ran from a junction with the Chester and Shrewsbury line north of Wrexham called Wheatsheaf to a limeworks at Minera. The line opened in July 1847 and passed through the Moss Valley and Brymbo areas that had mines and ironworks. The line had two very steep rope worked inclines and two tunnels between Wheatsheaf Junction and Brymbo which were a hinderance once traffic levels built up. 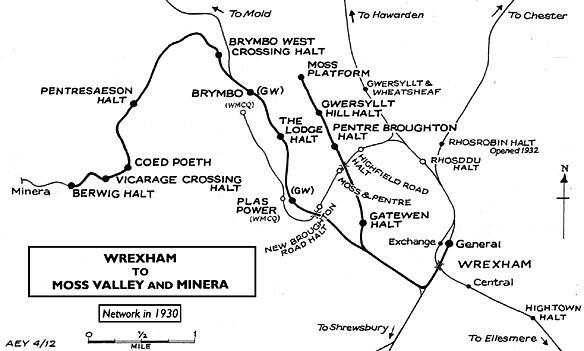 To solve the problem the Wrexham & Minera Railway (W&MR) company was incorporated on 17 May 1861 to build a three mile line from the Chester and Shrewsbury Railway at Croes Newydd to the original Minera line at Brymbo. The line opened as a single track branch on 22 May 1862 for goods services only and it was able to be worked by locomotives throughout. The original line closed between Brymbo and Moss but the rope worked incline on the east side of the Moss valley remained in use until 1908. On 11 June 1866 the W&MR was amalgamated as the Wrexham & Minera Joint Railway with the Great Western Railway (GWR) and the London & North Western Railway (LNWR) as part of a plan to create a through route from Mold to Wrexham; it opened on 27 January 1872. 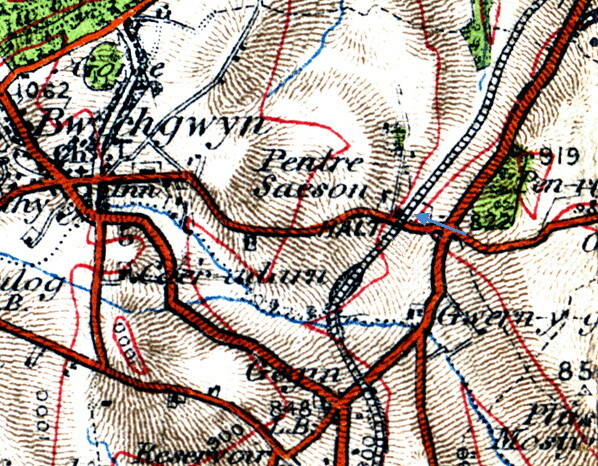 The sections of line that did not form part of this route, including the route between Brymbo and Minera, were vested solely with the GWR in 1871. The first attempt to introduce a passenger service onto the line had been in July 1866 but it failed as the line was deemed not to be up to passenger-carrying standards. The line between Croes Newydd and Brymbo became double track on 1 April 1882, and on 24 May 1882 the GWR introduced a passenger service between Wrexham General and Brymbo. The service was extended to Coed Poeth on the 15 November 1897. Pentresaeson Halt opened on 20 March 1905 when the passenger service was extended to Coed Poeth and given over to ‘railmotor’ operation. Located on the north-east side of a level crossing, the halt was a simple affair. The platform, on the up side of the line, was a simple timber structure. Early maps appear to show no buildings, but the halt eventually had a corrugated iron booking hut and shelter. It was usually unstaffed, but in 1924 it was the practice for a porter from Wrexham to issue tickets from the halt on Saturdays. 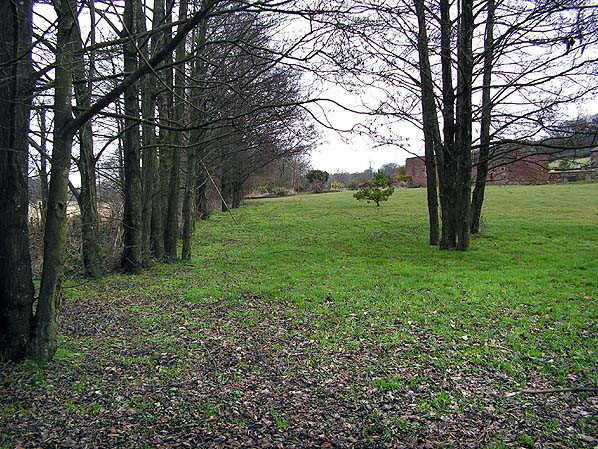 The halt served a sparsely populated area and took its name from the farm a short distance to the north-west– which, translated, is ‘Englishman’s village’. On the north-east side of the level crossing, east of the line, was a crossing keeper’s cottage and, to the east of that, a small iron works. On the 1 May 1905 the railmotor service was extended to run further west than Coed Poeth to Berwig Halt. Six railmotors ran from Pentresaeson Halt to Berwig Halt on weekdays, and six ran back to Wrexham. On Saturdays the service was increased to fifteen trains. Often railmotors had to be replaced with a locomotive and coaches on Saturday afternoons as demand was so heavy. The railmotor took 23 minutes to reach Wrexham General from Pentresaeson Halt, a distance of just over three miles. The July 1922 Bradshaw shows weekday departures from Pentresaeson Halt for Berwig Halt at 7:59am, 10:04am, 2:26pm and at 3:44pm. Services operated to Coed Poeth at 12.49pm, 5.06pm, 6.11pm, 7.14pm, 8.17pm and at 9.21pm. There were departures for Wrexham General at 8:23am, 10:30am, 1.15pm, 2:50pm and at 4:07pm, 5.13pm, 6.17pm, 7.20pm, 8.24pm, and 9.27pm. On Saturdays timings were altered in the afternoon. 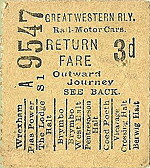 Bus competition had started to make inroads into passenger traffic receipts by the early 1920s, and by the early 1930s passenger services on the Wrexham and Minera line were hopelessly uneconomic. The GWR withdrew the service completely with effect from 1 January 1931 and Pentresaeson Halt closed completely. It was demolished after closure, leaving no trace. The line had been built to carry the products of local mines, quarries and steelworks and without the passenger service it could concentrate entirely on this traffic. The line through Pentresaeson Halt remained busy into the second half of the 20th century, although economies were made from 25 July 1954 when a number of the level crossings west of Brymbo, became unmanned. On 6 September 1952 the Manchester Locomotive Society ‘Denbighshire Rail Tour’ passed through the site of Pentresaeson Halt as did a brake van tour run by the Wirral Railway Circle on the 24 May 1969.
effect from 1 January 1972, and it was lifted shortly after. To See a film of the Wrexham & Minera Railway click here. Ticket from Michael Stewart, Bradshaw from Nick Catford , route map drawn by Alan Young. British Railway Companies, C. Awdry, 1990, Guild Publishing. Marcher Railways, by A. Bodlander, M. Hambly, H. Leadbetter, D. Southern & S. Weatherley, 2008, Bridge Books. Railway Passenger Stations in Great Britain, M Quick, 2009, RCHS. Railway World - February 1987 - The Wrexham & Minera Joint Railway, Rex Christiansen, Ian Allan Publishing. 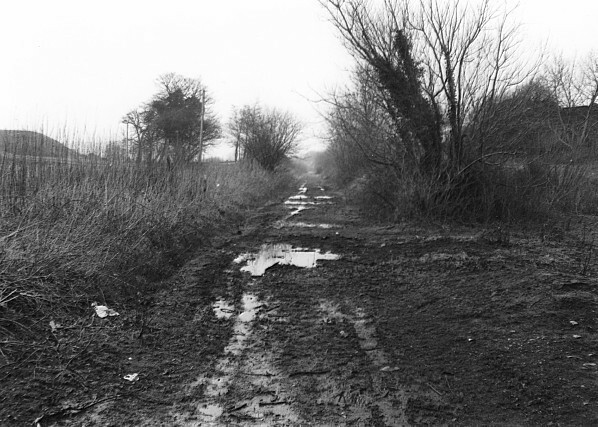 The site of Pentresaeson Halt looking north-east in February 1980. 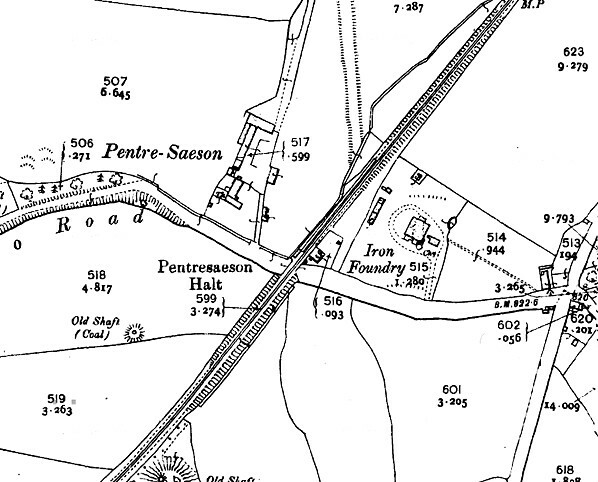 Pentresaeson Halt shown on a 1912 map. Pentresaeson Halt site looking north-east in February 2011. Looking north-east from the site of the level crossing at Pentresaeson Halt in February 2011.